Applications are accepted in the order in which they are received. Register early as some classes fill quickly. Regular registration March 3-31, 2019. From April 1 on, registration is on a space available basis only. Accounts with balance due on May 1 will be assessed a $50 late fee. Be sure to include your child’s current working- a working piece is a piece that you know all the notes to but are still working on technical and musical skills (intonation, dynamics, tempo, etc.) Please DO NOT try and guess what your child's current working piece will be in June! Put down what their current working pieces is NOW. You may email lasi@suzukimusiclosangeles.com to update the current working piece until May 15, 2019. LASI may cancel teacher training courses if enrollment is insufficient. Please enroll by May 1 so that a course you wish to take is not cancelled. If a course you enroll for is cancelled due to insufficient enrollment, you will be notified by May 6. LASI will not be liable for non-refundable travel tickets purchased before May 6, if LASI cancels a training course. Registration deadline is April 15. Video is due April 15. Music is available beginning May 15. More info on this program can be found HERE. Application including video are due by March 20. All chamber groups in CMW will have coaching with guest artist, Austin Huntington. This program is filled on a first come first serve basis. We have space for 4 chamber groups and registration will close when those groups are filled. Register early to make sure you get a spot. Music will be available beginning May 15. Add Tuition and appropriate Accommodations, Meals and a la carte items to your cart. Please note: you may come back and later and purchase accommodations and meals - the deadline is May 15, 2019. Proceed to check out using any major credit card. If you are unable to enroll online, call or e-mail the Director at lasi@suzukimusiclosangeles.com for a PDF copy of the application forms. 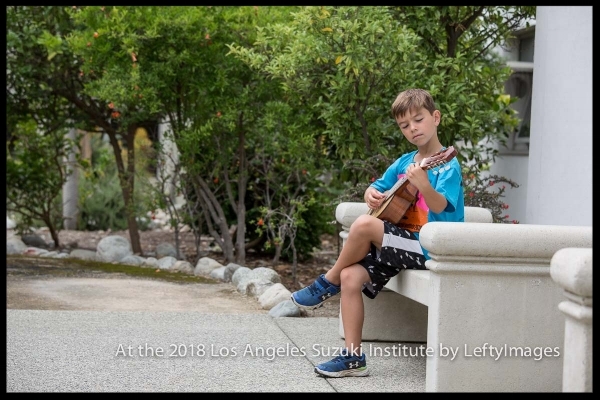 In the event that you decide to cancel your registration, notify the Los Angeles Suzuki Institute in writing by April 15. There is a $100 non-refundable cancellation fee per participant. The payment of all other fees will be returned if email or postal notice of cancellation is received by April 15. Due to commitments to faculty and travel plans, applicants who withdraw April 16-30 receive a 50% refund of fees (less the $100 non-refundable cancellation fee per participant). Withdrawal May 1 and after forfeit all fees. If you register after May 1, and then decide to cancel your registration, all fees are forfeited. If enrollment is full or a teacher-training course is canceled by LASI, all registration and course fees will be refunded. There are no refunds given for registrants who do not complete the course prerequisites or the SAA audition requirement, if the refund request is made after the refund deadlines. (If you are submitting an audition video to the SAA to do teacher training, LASI refund policies will still be applicable, regardless of audition result.) Registrants who have not completed the course prerequisites and audition requirement by the first day of the course will continue to participate as auditors. Auditors observe the class but do not fully participate. Auditors will not have the course registered with the SAA as completed. Please note: there will be no refunds for early dorm check out or unused portions of meal plan. Applications must be received by February 20, 2019.